In the last article, we have explored the possibilities of generating alpha on the market. As it can be seen from the list, alpha can be achieved by many ways and through many strategies and instruments. Reason why I would like to focus in the next chapters of this series on the systematic trading of options on VIX, respectively to the ETF / ETN linked to VIX, is that VIX and its derivatives almost always meet the Alpha trading criteria in most of the points. Let’s take a look at the points from my previous article once again, and will show you why VIX is interesting for us when it comes to alpha generating. 1) Contango – The VIX term curve offers by far the highest level of long-term contango. The monthly alpha from this trading is around 5% and higher. The futures contract term curve for the VIX index has already been shown in the previous article, in the picture below, you can see the current percentage of contango level (in this case, expressed as percent difference between the December and November futures contracts), which currently stands at 9.89%. 2) Tracking error – high intraday volatility of the value VIX brings also very high tracking error around 5% a month. Higher tracking error is offered only by 3x leveraged ETF on Gold Miners, for example. Let’s have a look on interesting comparison of the non-leveraged versus vs. leveraged instrument, in this case ETF / ETN linked to VIX index, namely VXX and leveraged UVXY. 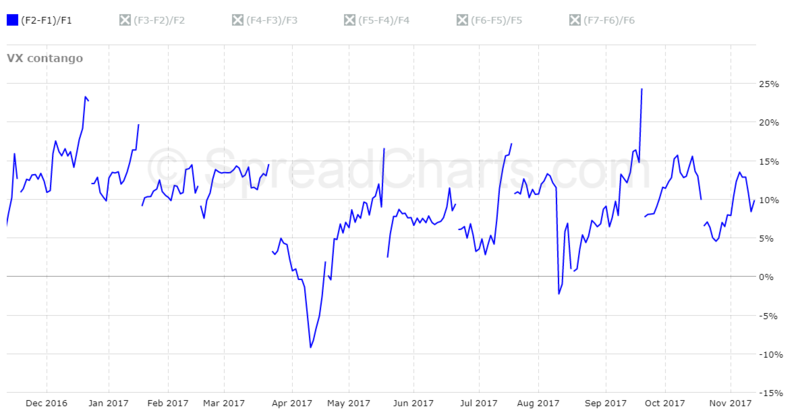 From the chart can be seen that even in a relatively short period (the period under review was between August and first half of September 2017), there is a significant dispersion of the price of both instruments due to relatively high intraday volatility. Thus, while VXX is at the beginning of this period at practically same values ​​as at the end (-0.47%), UVXY drops significantly (-16.45%). The difference is therefore strongly significant in this short period of time. 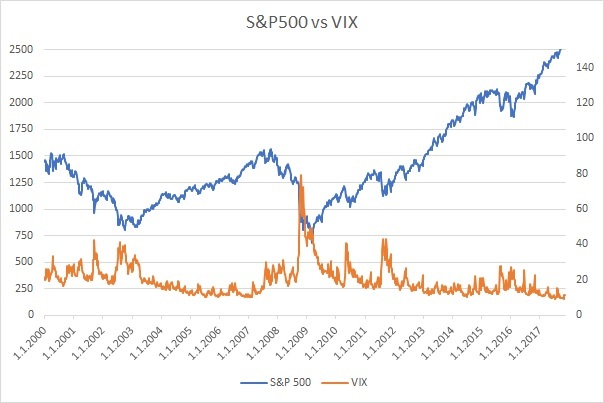 3) Statistical arbitrage – VIX can be well statistically described when it comes to its history, so it is possible to say with what success probability a person enters the trade. Trading of VIX generates the highest risk-free return on short position entries for 2 standard deviations and more. 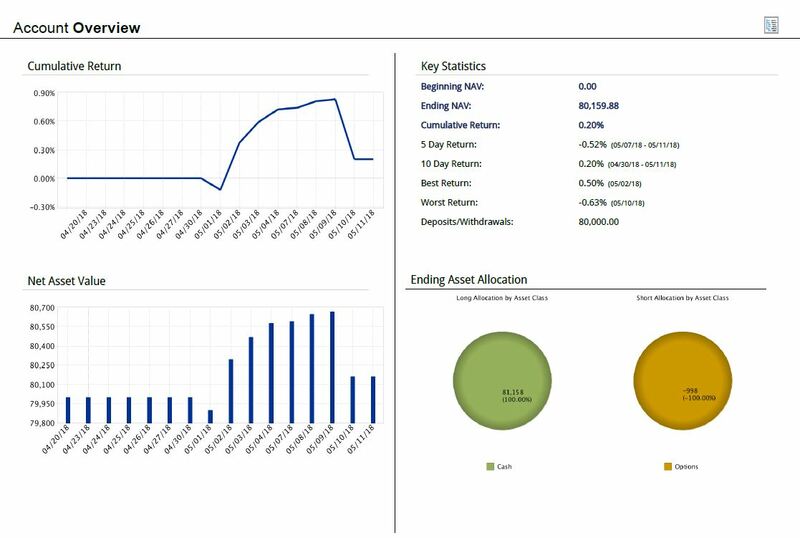 Within our fund, we are using our own software solution for managing optimal entry into the trade, in the next chapters of the series we will discuss how it works, what conditions uses, and what are the other needs for timing a good trade. 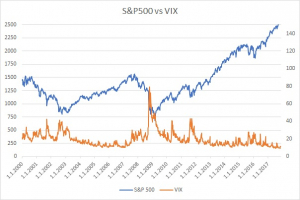 There is also a very close relationship between the daily change of the S& P500 and VIX, which allows pair trading. 4) Deviation from Fundamentals – VIX correlates well with fundamentals in the markets, especially those expressed in the levels of spreads of high yield bonds. 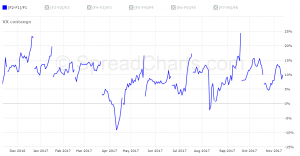 Short-term deviations from the equilibrium value caused by, for example, sentiment around the central bank’s decisions or political events, offer from time to time space for active managing and opportunistic trades. 5) Options – liquidity on options is very good within short-term options. In general, there is no problem with the availability of strikes and expirations. Lower liquidity and higher spreads in long maturities are compensated by the ability to form some interesting option strategies that eliminate some of the problems of VIX trading in a shorter term (high volatility). As it can be seen, VIX and its derivatives meet the Alpha Trading requirements in almost all the points. In the next part I will discuss the contango in detail and we will focus on the ETF / ETN construction linked to VIX.